I will admit the thought of attending the Grand Opening of Shanghai Disneyland wasn’t on my radar. It was never in the realm of possibilities in my mind. A small town boy from Prince Albert, Saskatchewan, Canada, being among the first people to experience the grand opening of a Disney park? What a silly thought. 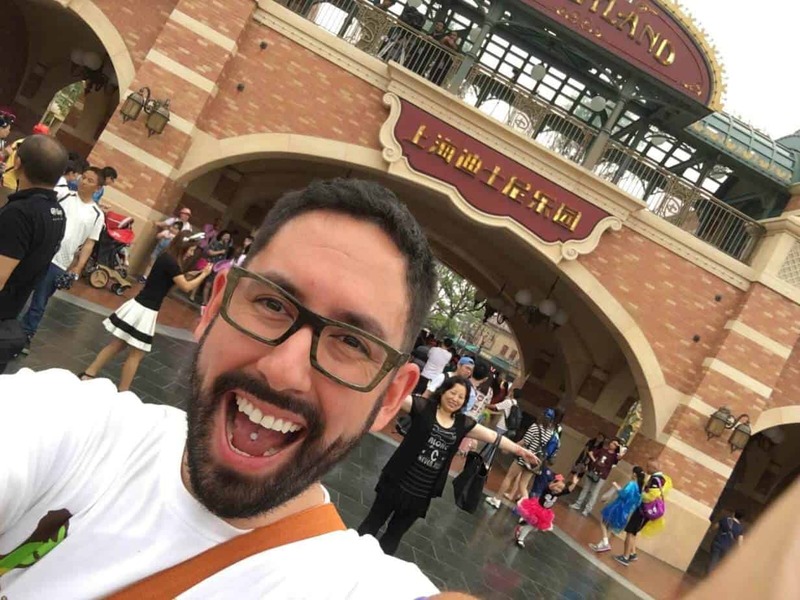 After I moved to Tokyo and began this blog, the idea of going to Shanghai Disneyland for its opening day started swirling around in my mind. 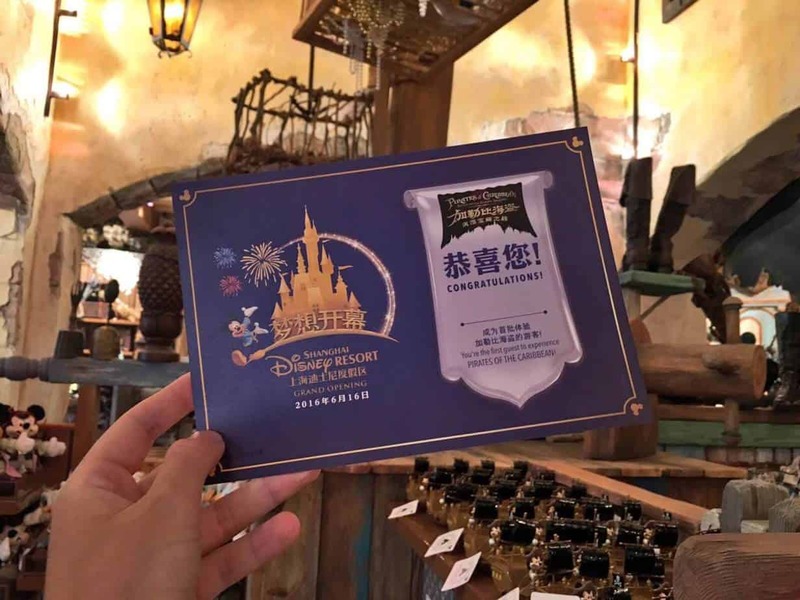 Once tickets and hotels became available, I jumped on it faster than a family of 4 sprinting to Pooh’s Hunny Hunt at 8:00 AM on a Saturday at Tokyo Disneyland. Booking this trip was not without its challenges. There were technical hurdles, a language barrier, and the need to get permission to enter China. 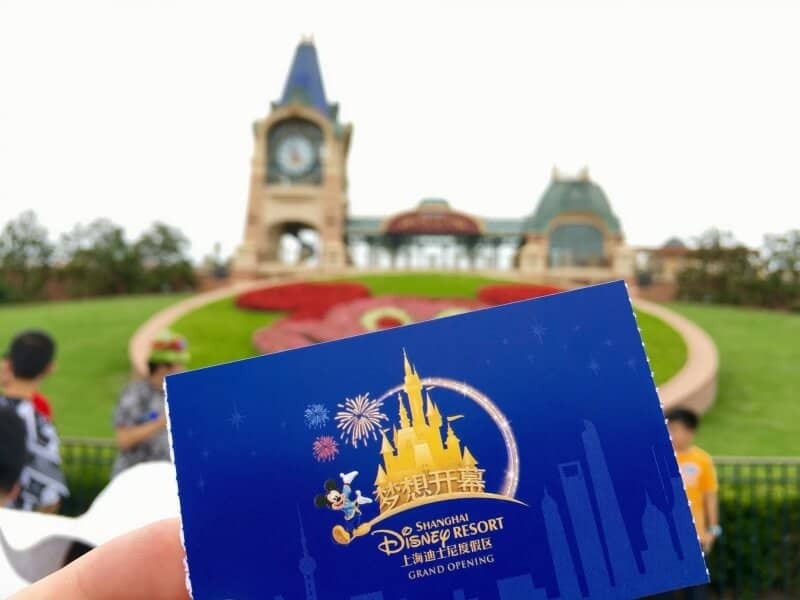 After conquering all the hurdles (which I will go into detail in another post) I successfully booked myself and a couple of friends for the Grand Opening of Shanghai Disneyland. Did I do a little victory dance? You bet I did! And maybe shed some tears of joy, too. The experiences I had with the friends I made during three seemingly quick days made this into a trip of a lifetime, and I am thankful I had the pleasure of sharing it with each and every one of them. You can also listen to our trip report in two individual episodes of the TDRNow Podcast. Episode 42 is 2.5 hours of Shanghai Disneyland, and episode 42.5 answers our most asked questions about Shanghai! Also, don’t forget to read my first impressions about this gorgeous Park. All right, let’s get to it. 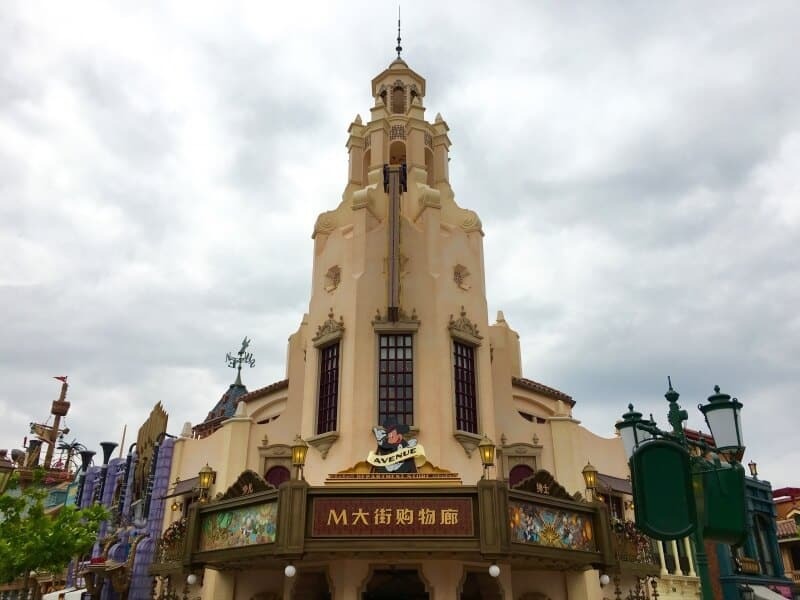 Here’s part one of our multi-part trip report for the Grand Opening of Shanghai Disney Resort! I headed to Shanghai the day before the Grand Opening. The reasoning for this was to play it safe, and if any delays happened, it would not impact my time in the park. 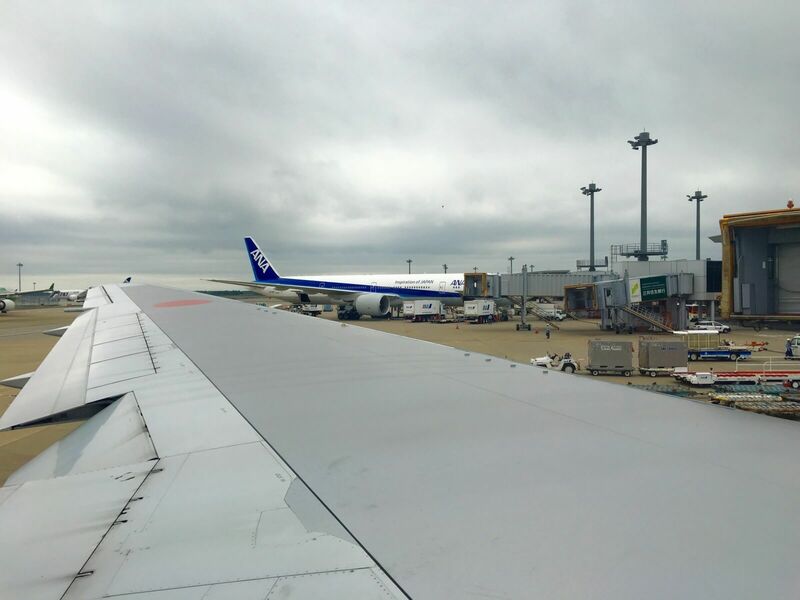 My flight with ANA (All Nippon Airways) was my first experience with this particular airline. I have nothing but positive comments about the entire voyage. The flight crew, food, and quality of service are up to the Japanese standard. 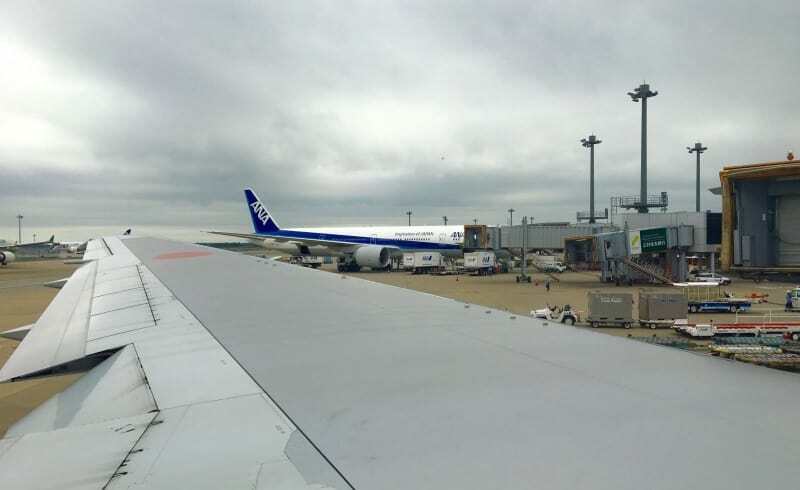 The flight was delayed leaving Narita by an hour and a half, due to traffic at Shanghai’s Pudong airport. While waiting for our flight, this is the first instance where I would meet one of many new friends during this adventure. Joel and Steve were taking the same flight as myself to Shanghai and attending the Grand Opening, too! Joel knew me through our podcast and instantly recognised me. As it turned out, we were staying at the same hotel for the first night in Shanghai, which was The QUBE. We all decided to figure out how to get to the hotel once we landed. Before boarding our flight, I popped in my travel SIM Card from Hong Kong (and I highly recommend it to bypass the Great Firewall of China) into my unlocked iPhone. My reasoning was so I did not have to worry about it once on the ground in Shanghai. Once we arrived in Shanghai, the three of us went through customs without any issues (note: make sure you have the proper visas) and it was time to head to our hotel. I had looked up the location of the hotel and how far it was on the metro, which was the easiest way to get there with only four stops from the airport. Finding the metro was easy, and buying tickets and getting on the right train was a breeze. Everything is in English, so there are no worries in the language department. It was raining when we emerged from the metro and had to walk in a downpour as we made our way to our hotel. Thankfully, The Qube Hotel was only a couple blocks from the subway. While exiting the subway, an older gentleman had the brilliant idea of stopping atop the escalator and open his suitcase to find an umbrella. He was lucky I was paying attention otherwise I would have trampled right over him. I had some choice words I muttered under my breath. Stopping right at the top of an escalator is not the most brilliant of moves and not to mention dangerous. Checking into the hotel was painless, and the staff spoke a high level of English. After checking in, my new-found friends and I agreed to meet for dinner after we got settled in our rooms. My room was much nicer than I was expecting. I booked the hotel because it ranked high on Expedia (affiliate link). I can admit that I am lazy in some aspects of planning and didn’t give it much thought beyond that. One of the first things I noticed was the bottles of drinking water, which I was relieved to see since I read that it’s ill advised to drink the tap water. A fellow named Jamie greeted me with a huge smile and a firm handshake. He informed me that he is a fan and avid listener to the TDRNow Podcast, and their reason for staying at this particular hotel was because of our recommendation in a previous episode. I was introduced to the rest of the group: Claire, Sophie, and Bryson. They had all just returned from doing some pre-shopping in Disneytown (which was a smart idea that I wish I had thought of). We stood at the hotel entrance discussing what we were all looking forward to in the coming days and Disney in general. You know, the typical topics you discuss when you make new Disney friends. After our hour-long discussion, it was time for us to get food (we settled on McDonald’s, which was next door) and we all went our separate ways. At the time, I don’t think Jamie could have known that his decision to call out my name as I was leaving the hotel set the positive tone for the rest of the trip. The following morning I checked out of the hotel (after having the breakfast buffet of course) and caught a taxi to Shanghai Disneyland Hotel. It wasn’t without some confusion on the taxi driver’s part. We explained to concierge where we were going, and since the resort does not show up on Google Maps (or any maps actually), there was some trouble explaining it to the driver. Eventually, it got sorted and we were off on our way! The total cost of the taxi was under $20, which is not bad at all. As you arrive in the resort, you’re greeted with a gigantic sign which reads “Shanghai Disney Resort.” At that moment it hit me: I was visiting the Grand Opening of a Disney Park! 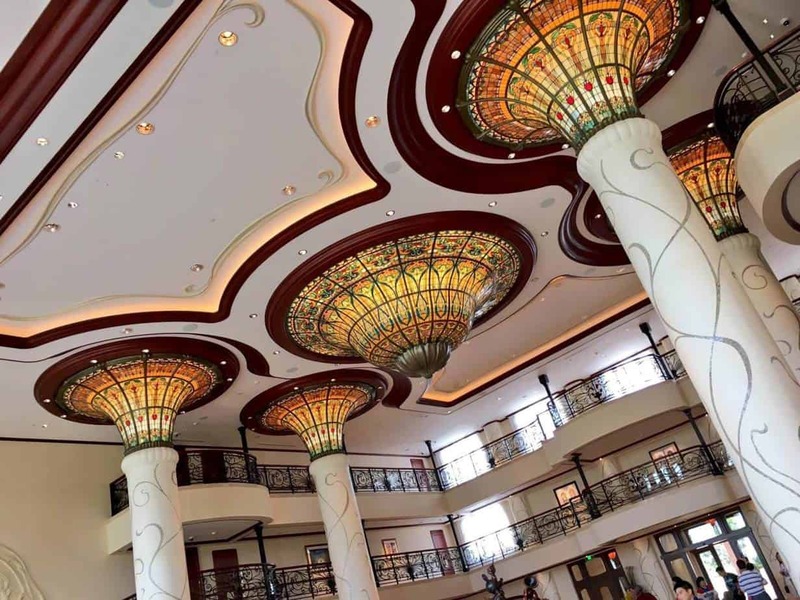 The feelings were overwhelming but quickly subsided as we pulled up to the Shanghai Disneyland Hotel. That familiar “Disney Magic” immediately swept over me as I stepped out of the taxi. Cast Members greeted us with huge smiles and a pleasant “Good Morning!” Some Cast Members, all situated outside the hotel, were giving high fives, smiles, and bottles of water as guests entered the hotel lobby. The first order of business was check-in. I knew ahead of time that the room wouldn’t be ready until 15:00, but checking in and dropping off our bags was certainly possible. The check-in process was relatively easy, and the only minor issue we encountered was asking for non-feathered pillows (one of our friends has an allergy). The Cast Member appeared to have a good grasp on English, but I felt since I went “off script” as to what people would ask, she didn’t quite understand what I was asking. She quickly informed me that she would ask someone for me. A few seconds later another Cast Member came and took care of my request. In the end, they told me to choose between a “chemical pillow” or a “buckwheat” pillow. I selected the “chemical pillow”, only because it was amusing to my ears. Once I was relieved of my baggage, I decided to wait in the hotel lobby for the rest of my party to show up. 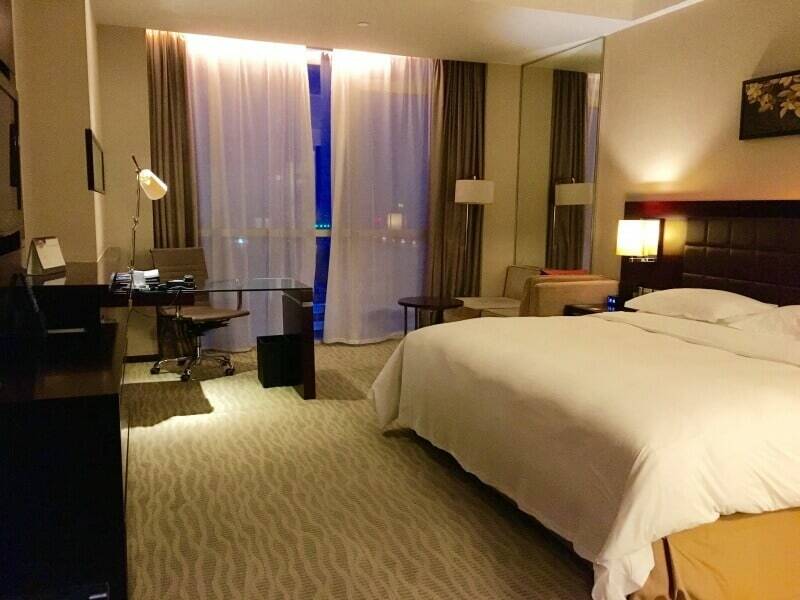 They were staying at a different hotel in central Shanghai. 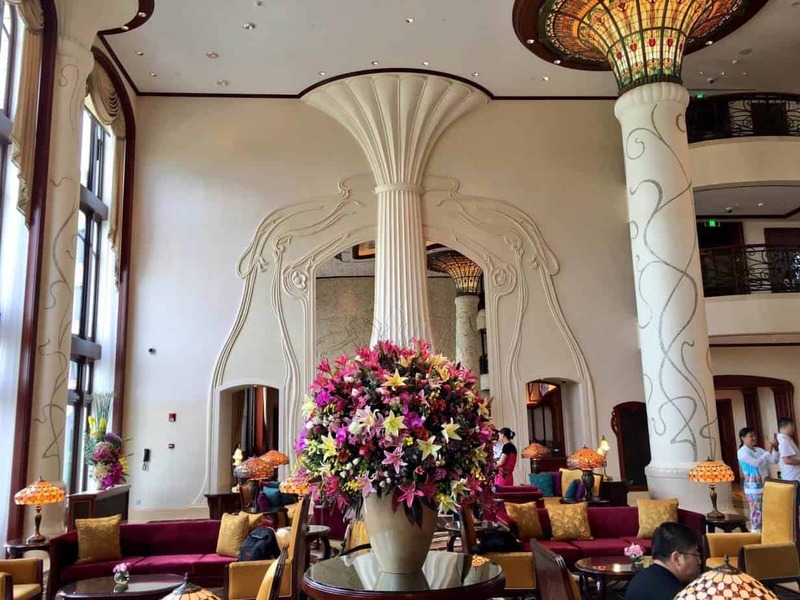 The lobby of the Shanghai Hotel is simple yet lavish in its design, with a large statue of Mickey and friends right as you enter the hotel lobby. Being Grand Opening Day, many people were from Disney Corporate (I made a guess based on how much better dressed they were than me). I chose to wear my Chip n’ Dale Summer Festival outfit from Tokyo DisneySea because everyone needs a splash of colour in their lives. I was standing in the lobby in bright yellow, white, and pink clothing, while everyone was in business attire. Safe to say, I stood out, which lead to starting my own “Meet n’ Greet” with random people who wanted a photo with me and my “crazy” outfit. 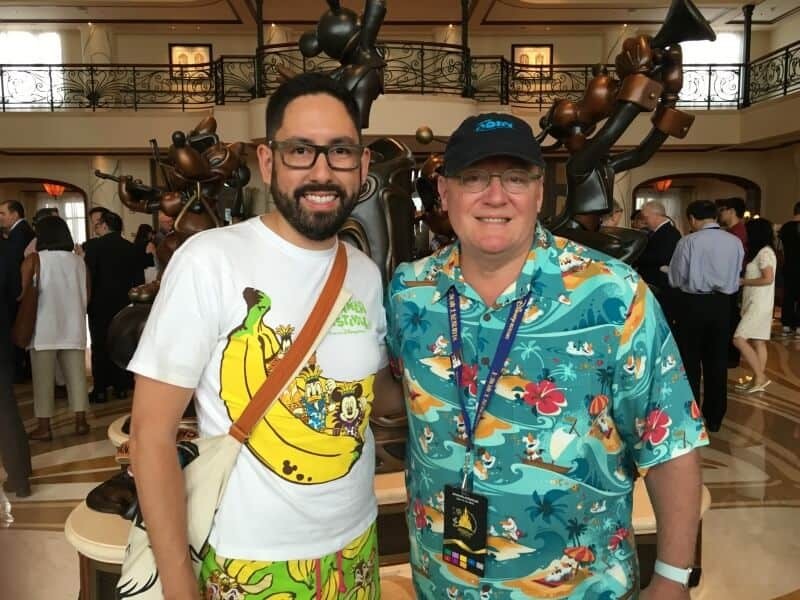 I wiped my sweaty palms with my Chip n’ Dale towel and walked up to Mr. Lasseter and introduced myself. Mind you, my nerves were at full throttle at this point. The only thing I could muster was, “I just wanted to say thank you for everything you do and that I greatly appreciate all your work.” John’s demeanour is welcoming and calming, which helped with my nerves (he’s just a person like everyone else, but you know how crazy our minds work sometimes). He said, “Thank you” and how nice it was to see me. Of course, I had to prove to everyone that I met John Lasseter, so I politely (my Canadian side came out) asked for a photo and he happily agreed. I thanked him again and we parted ways. I could have asked him a million questions, but I didn’t want to take up his time. Shortly after this, another well-known person walked into the lobby: George Lucas. George roamed around the hallway for a bit with his bodyguards. I didn’t notice anyone approach him for photos or to speak with him, so I decided just to appreciate his presence from afar. It’s not every day you are in the same room with legends. All of this happened even before I got to the Park! Shortly after that, my friends Derek, Linda, and John showed up, along with Tom, Sarah, and Mark! After all the photo-taking and celebrity sightings, the large group of us hopped on the shuttle bus to the Park, which drops you off just outside Disneytown. By this time it was around 10:00 AM and the Park opening was not until 12:00 PM, which meant there was plenty of time to go shopping at the Disney Store! After shopping—I did the package pickup instead of carrying everything—I met up with everyone to get into line. By this point, the area just outside security was cramped and the gates were closed. I tried finding a security guard who spoke English, but that didn’t work out. The organised line behind the security gates stayed that way until security mentioned something in Mandarin, and then it turned into a rush to the gates. Our small group just went with the flow since there was not much choice in the matter. Eventually, the line stopped moving, and we claimed our spot just outside the security gate. As I was looking around and taking photos from our spot, I saw our new friends from the previous day wandering around just as confused as us. I yelled over to Jamie and told them to join us in line. Our new group of 9 was made up of individuals from different corners of the globe—Canada, USA, UK, Australia, and Japan—and we all became instant friends. Laughing, joking, discussing all the Parks we have visited previously and sharing our enthusiasm and excitement of being at the Grand Opening. We even witnessed a fist fight between a man and a woman. The woman—I think—won, and then security came to break it up. Security gates eventually opened up around 11:45 AM to allow more guests through to the turnstiles, which was uneventful compared to the fist fight witnessed earlier. At the turnstiles, the Cast Members took our printed e-tickets and exchanged them into a Park ticket, which had an exclusive design just for the Grand Opening. The devices used to scan your park ticket have a camera which takes a photo of you to associate it with the ticket. Everyone made it through the turnstiles around 12:15 PM, and Cast Members handed us pins to mark the special occasion. We all took a moment to let it sink in, being in a Disney Park on its first official day of operation! Walking on to Mickey Avenue for the first time was surreal. It took me back to the first time I set foot on Main Street U.S.A at the Magic Kingdom, that feeling of knowing this place was something special, different, yet seemingly familiar. Numerous Cast Members lined both sides of Mickey Avenue and were giving out high-fives to everyone who wanted it. Before you ask, of course, I gave high-fives. At the end of the rather short Mickey Avenue is the Gardens of Imagination. Photos or video don’t do it justice. This area in front of the Enchanted Storybook Castle has some places to sit and relax and excellent viewing areas for various shows which use the castle as the backdrop. There are also two attractions in the Gardens themselves: Fantasia Carousel and Dumbo the Flying Elephant. Once everyone collected themselves and shook off the initial excitement (but not too much), we came to the realization that none of us knew exactly where to go or which attraction to run for first. Let that sink in for a moment. A group of “Disney experts” had no sense of the land or held the “perfectly efficient” strategy that so many of us have for the other Parks. Shanghai Disneyland was unchartered territory for everyone, and it felt spectacular, a feeling that I thought I would never feel again. 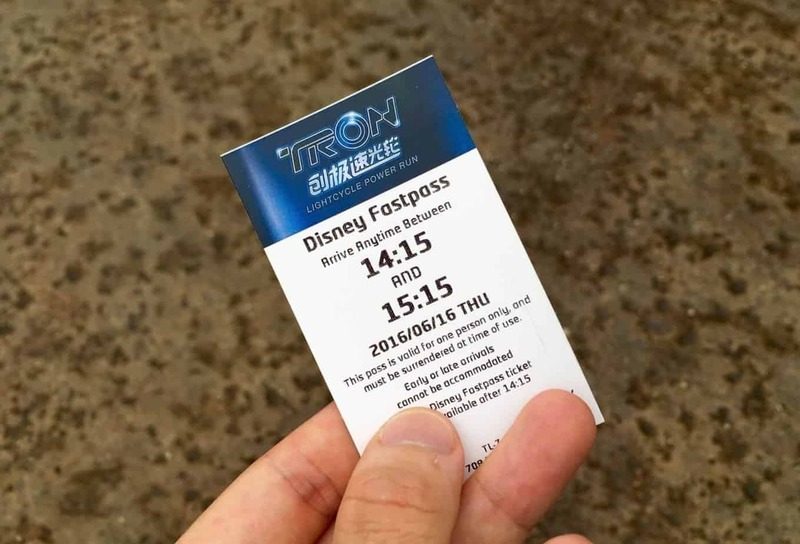 Everyone eventually agreed that TRON Lightcycle Power Run would receive the honour of becoming the first FastPass for our Shanghai Disneyland experience, and so that’s where we headed. Walking from Mickey Avenue to Tomorrowland is not a quick stroll like at other Disney Parks (such as going from Main Street or the World Bazaar to Tomorrowland). No one was in a hurry; we were all soaking in everything as we walked by it for the first time. TRON is the backdrop for Tomorrowland, and its wavy architecture gives an accurate—in my opinion—sense of “the future.” When you enter Tomorrowland, you are on the second floor of the area. FastPass machines are on the bottom floor and dispenses passes for both TRON and Buzz Lightyear. Everyone grabbed their FastPasses, and we began making our way over to Treasure Cove to hop aboard the Pirates of the Caribbean: Battle for the Sunken Treasure. We walked through Fantasyland to get to Treasure Cove, which is the long way since you are going around the perimeter of the Park and not cutting through the Gardens of Imagination. Fantasyland is faithful to the Disney Animated Classics of which it’s themed after, with a heavy presence from modern films like Frozen, Tangled, and the most recent Alice in Wonderland, and sprinkled with the classics. I have no qualms with the tastefully executed theming. After an eternity of walking (I am so grateful for my walking shoes by this point), we finally made it to Treasure Cove. Coming from Fantasyland entering into Treasure Cove, you can see Roaring Mountain—which is over in Adventure Isle—across the cove. Pirates had a wait time of 20 minutes posted, but before we made our way on to the attraction we had to capture this momentous occasion; our first attraction in a brand new Disney Park. The queue for Pirates takes you through various ransacked buildings, from jail cells to a room with a gigantic hole in the wall. Once you reach the end of the queue, you are seated in a boat which holds a large number of people. I will spare you explaining the details of the attraction; you can watch a ride through video on YouTube if you’re curious. After stepping off the boat, I was gushing with excitement. This attraction, to put it simply, is something else and nothing like the classic Pirates attractions we all know and love. Just before leaving Pirates, we received a numbered certificate indicating we rode the ride on Opening Day, which was a delightful surprise I was not expecting. 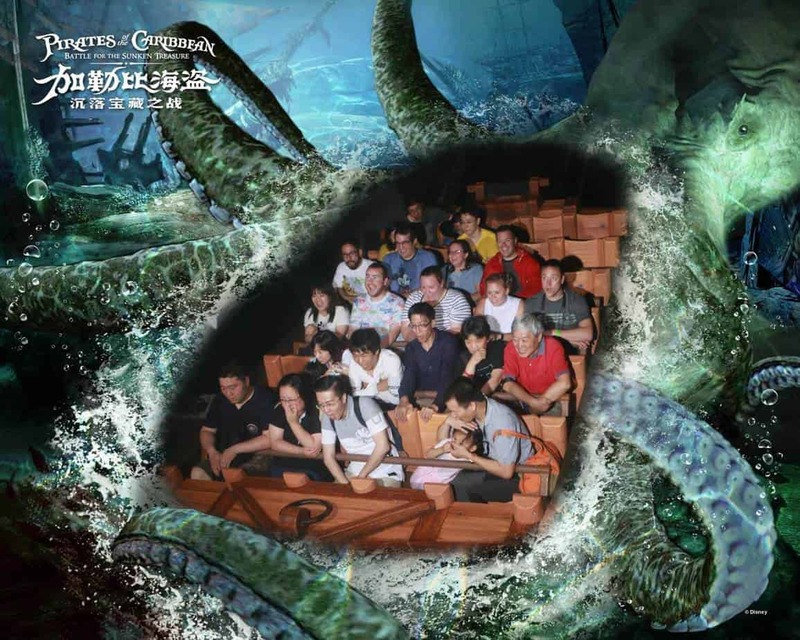 The on-ride photo speaks volumes of the excitement and joy everyone felt during the final scene. It’s difficult to recall what everyone was saying about the attraction; the excitement was so high that we all spoke a thousand miles a second. Once the high eventually left, I realised the parade started in 20 minutes. This is where my “Tokyo Disney” side came out (Bryson was also keen on queuing for the show early). I give Bryson full credit for this brilliant idea of watching the parade from the beginning of the parade route right in Fantasyland. This meant that we would be among the first to see the first showing on Opening Day. The parade route is the longest of any Disney Park, so finding a decent spot is not terribly difficult. 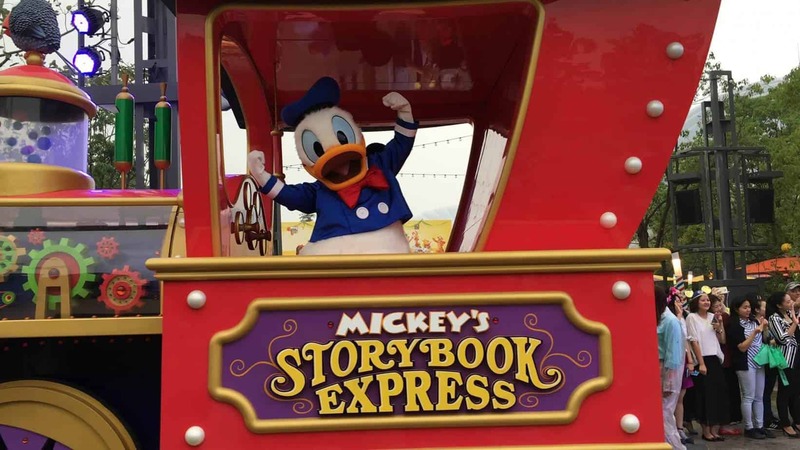 Mickey’s Storybook Express is a cute and character-packed parade featuring a tonne of Disney Characters, including those from Tangled, Frozen, Winnie The Pooh, and Mulan. By far, the Mulan portion of the show is easily the best part and most fitting. Mulan appears as her male alter-ego “Ping,” riding atop “Khan,” her faithful horse, and accompanied by drummers on an exquisite float modelled after a traditional Chinese shrine. Overall, the parade itself is enjoyable but certainly not one of the best. It’s good for what it is. The music itself is catchy (shows in other Parks use the same or similar music) and quickly turns into an earworm. The use of Mulan as “Ping” is an excellent choice, as the decision to have her in the parade dressed as the princess would have been an easy out. 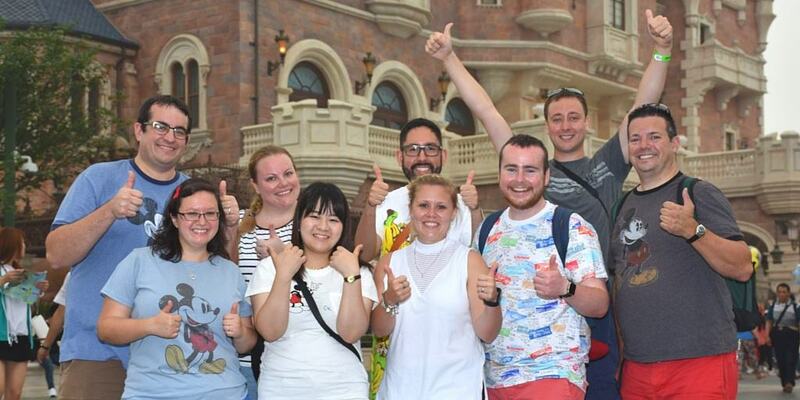 Our first day in Shanghai Disneyland is a long one, so to give your eyes a rest, I will share the rest of Day One in part 2 of our Shanghai Disneyland Grand Opening Trip Report! Come back in the next few days for the continuation of our trip report and where I discuss TRON Lightcycle Power Run—spoiler alert—it’s awesome! And I’ll fill you in on details of what we ate. Hint: It’s at Pinocchio Village Kitchen and Barbossa’s Bounty. For more on Shanghai Disneyland, check out our first impressions and podcast episodes where I answer your burning questions about Shanghai Disney Resort! Also, make sure to read the trip report from DisneyTouristBlog! Great report. Looking forward to reading the remainder of the trip. I do have one question, you mentioned you showed “printed e-tickets” at the turnstile to enter the park. I bought ticket on the Shanghai Disneyland website for August and had to provide my USA passport number to purchase. Yet, my confirmation number email did not come with an attachment to print an e-ticket or a barcode to show at the door. I contacted Shanghai Disneyland live chat and the person at the other end says they can’t sent a barcode to print for security reasons, and advices me to just proceed to the turnstile with my USA passport and ticket confirmation number to show. Do you think they can print the ticket there with just that information? Seems to me it wound take me a long time at the turstile to get my ticket since I don’t even know if the cast member would be able to perform that transaction. So I’m already concerned that my entry to the park will be delayed and ridden with a lot of back and forth and miscommunication. Did you see any cast member entering confirmation numbers into a keypad at the turstile? That’s what has me concerned the most. Any information or ideas anyone can provide or should I calm down and just let it be? With our e-tickets what we did was print them from our account we created on the website. I never printed anything from an email. You should have created an account to buy your tickets, so you should be able to login there and see your tickets listed and able to print them off. I would try that first. Well thank you for your input. I guess I will have to sweat it out until August 2nd comes around. Thanks again and my compliments on the TDR Explorer site.